Feelfree make a superb range of solo and tandem sit on top kayak for touring, kayak fishing or just loads of family fun on the water and represent great value for money and build quality. This top selling Sit on Top is a great little kayak for all-round paddling. A stylish modern all round Sit on Top kayak for perfect for surfing and touring. A Sit on Top Kayak designed for kids and smaller paddlers. A great kayak for family holidays and adventures. The Moken 12 is packed with features and performance all fisherman crave. Excellent on the water performance. The Moken 10 is short, light weight and incredibly stable. 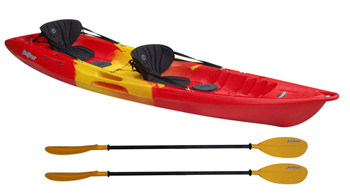 Sit on top kayak with similar stability and features of the Moken 10. The Moken 12.5 is a superb stable sit on top kayak for fishing. A fishing sit on top kayak combines stability with all the features needed to fish. Specifically designed for the freshwater kayak fisherman. The Gemini Sport offers flexible seating options thanks to a centre seat. One of the few sit on tops available that feature 3 full seat positions. 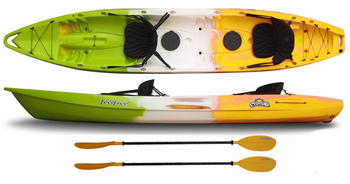 A versatile touring kayak that is great for general recreational use. The Fish & Tour has now been discontinued - please see our range of other fishing kayaks for alternatives.